Monday, Tuesday, 10:00 a.m. - 5:00 p.m.
Wednesday, Thursday, 9:30 a.m. - 6:00 p.m.
Friday, 9:30 a.m. - 6:30 p.m., Saturday, 9:00 a.m. - 7:00 p.m. Hair braiding has built close-knit relationships between family, friends, and neighbors for many generations in our culture. 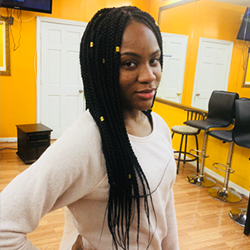 Simina African Hair Braiding brings this tradition to Boston where we braid, weave, and twist hair for people from every walk of life. 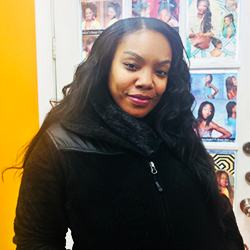 We understand the unique needs your beautiful hair requires, and our hair braid stylists put the utmost care into every braid and lock we put in. 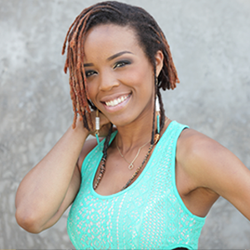 Visit us today if you're looking for skilled and friendly hair braid stylists in your neighborhood. Our owner, Coumba, started hair braiding when she was young. 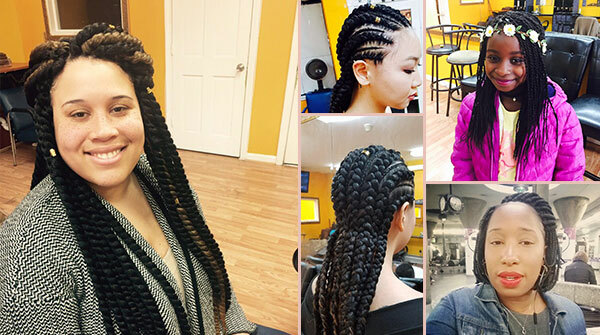 For more than 20 years, she's developed her skills and doing hair became an art form for her. We guarantee that when you walk into our hair salon, you'll become part of our family. You'll feel comfortable knowing that the shop is well-maintained and clean and that everyone leaves happy. 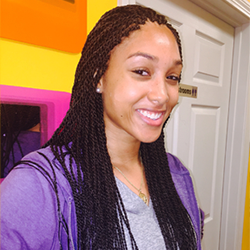 Read what our customers love about our hair braiding service.